Are Smelly Foods Good For Us? One of my growing concern now at home is creating more storage spaces in my kitchen. Now that we are more into experimenting with our newly found home biz, we wanted to create more storage for our baking supplies. We have lots of pantry cabinets and kitchen cabinets, but I think that our kitchen stuff cannot be arranged properly to maximize storage spaces inside the cabinet. Glad that I've found some ideas from http://www.ovisonline.com/. 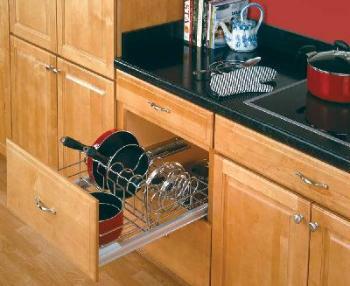 Lots of cabinet organizers to choose from. These organizers will not only make our cabinets and shelves looking clean and organized but will also make it easier for us to look for things that we need at a glance. This will enable us to save a great deal of time during our busy hours in the kitchen.